The Plenary Session of the Constitutional Court elected Mr. Bitskey as Secretary General in November 2010. He assumed his office on 1st January 2011. 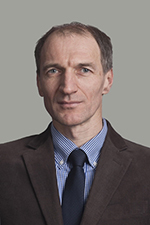 Mr. Bitskey graduated from the Faculty of Law of University Eötvös Loránd in 1995. He participated in postgraduate programmes: in 1997 at the University of Birmingham, in 2000-2001 in the T.M.C. Asser Instituut of The Hague. Mr. Bitskey was councelor of the Constitutional Court of Hungary from 1995. From August 2000 he was the head of the Department of Constitutional and Legal Matters at the Office of the President of the Republic, from February 2006 until August 2010 he was deputy head of the Office of the President of the Republic. From September 2010 he was chief councillor of the Constitutional Court. He was elected to Secretary General by the Plenary Session in November 2010, he entered into office 1st January 2011. His main fields of interest are: constitutional law, constitutional jurisprudence and law on discrimination. He is lecturer at Corvinus University of Budapest.